The EO Travel Backpack comes with three separate compartments. One section protects your laptop and iPad and can fit up to a 17-inch MacBook Pro, another organizes your gear, and the final section is like a suitcase where you can pack your clothes. The computer compartment is designed for quick and easy airport screening. 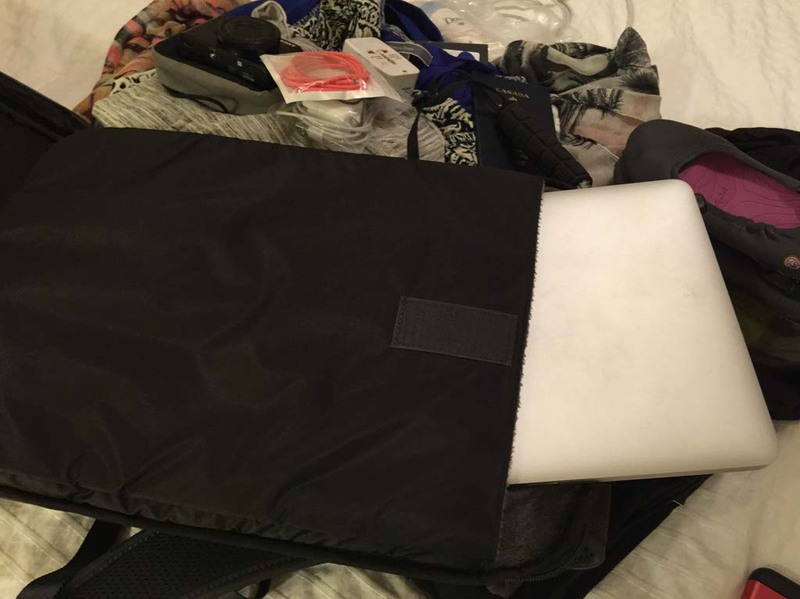 Rather than trying to pull everything out of your bag to get to your computer, it’s in a section alone. There is soft, plush fabric on the inside of the pouch for protection and a small outer compartment for your cord. The zipper runs the full length of the bag so the computer won’t get stuck when you’re in a hurry. I easily slid my laptop into the bag and put the cord in the outer compartment. The Velcro keeps it safely in place and the full length zipper makes it easy to get out even if the bag is completely full. This separate computer section is what drew me to the EO Travel Backpack in the first place. The front section of the bag has more than half a dozen compartments to store your gear. It can hold my bathroom bag, GoPro, camera, phone, passport, attachments, cords, and adapters. If you’re traveling with a larger SLR, it might not fit comfortably in this compartment, but I’m trying to minimize my gear so I’m only bringing the Sony Cyber-shot. The two pen compartments are great for travelers. I’m always digging for a pen to fill out customs forms. It may sound like an obvious thing but not all bags have a separate section for pens. The triple coated weather-resistant front panel is ideal for unpredictable weather locations. The only addition I would like for this part of the bag is a lock or interlocking zippers for better protection against theft. I’d gladly carry my passport and money in this section if I felt like it was more secure. The middle section is complete genius. It expands 35% for overnight travel and opens like a suitcase. 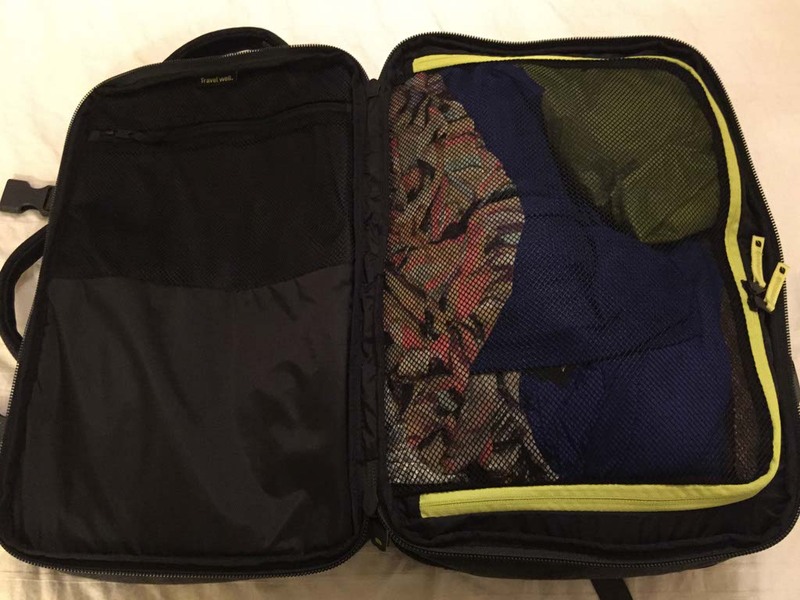 There are two zippered sections so you can separate your dirty clothes and if you roll your clothes, you can fit enough for an entire week or longer. I packed five shirts, three pairs of pants, a pair of leggings, a bathing suit, two dresses, shoes, two scarves, underwear, and a dry bag in this section and didn’t struggle with getting it closed. The back panels and shoulder straps are padded and have breathable mesh, and the sternum strap is comfortable for carrying. Because I’m trying to limit myself to one bag for a trips, I’d like to have a waist strap as well. When my bag is heavy or I’m going on longer trips, a waist strap relieves upper body stress. It’s a smart, simple fix and goes a long way and would make the EO Travel Backpack more suitable for longer travel. The Incase EO Travel Backpack has some seriously unexpected, fantastic features like easy access to everything, smart organization, and simple protection for your laptop. Everything is already packed; I might as well go on a quick vacation. Maybe I’ll hop in the car and cross number 42 off this year’s bucket list. What’s your go-to backpack for travel? Is there anything missing from the EO Travel Backpack? I’d love to read your thoughts. 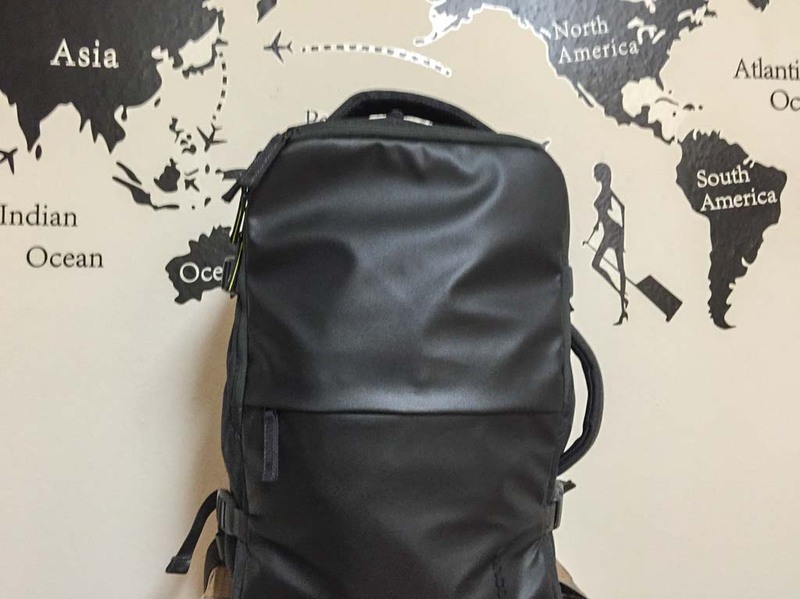 This entry was posted in Product Reviews, Reviews and tagged Incase, Incase EO Travel Backpack, travel, Travel Backpack, travel gear by lesleycarter. Bookmark the permalink. This is incredible. I will have to put this on my list. I never check a bag anymore either! I love that it’s like a suitcase and backpack in one! I’m bringing it with me to Israel at the end of the month and I’ll let you know how it goes. Sounds great. How heavy does it get when fully loaded? Some air lines have weight restrictions for carry on. How did you manage to pack clothes for a whole week? I need a small suitcase even for a weekend visit out of town. The bag itself isn’t very heavy so I guess it depends on what you put in it. I carry the same gear on all of my trips and I’ve never had an issue with weight restrictions but I do focus on that when buying a computer, camera, and other gear for travel. I actually think it’s a little easier for women to pack lightly. I usually bring two pairs of shoes and wear the heavier ones on the plane. I can wear one longer, dressy tunic as a shirt with jeans or leggings, as a beach dress or day dress, or as a more fancy dress for the evening if I add a necklace or shoes. That makes three to five outfits with just three pieces of clothing and simple accessories. I definitely have way more than enough for Israel packed in the bag and still have some space left over. This is so much easier for women. I always compare my clothes volume to my wife, who packs the same number of items (except for toiletries), and guaranteed the volume of my stuff is 50% more. And I am not even a big guy. Even simple things like underwear and a bathing suit can take up way more space for a man. I still managed to travel with just a carry-on when I had a newborn though. 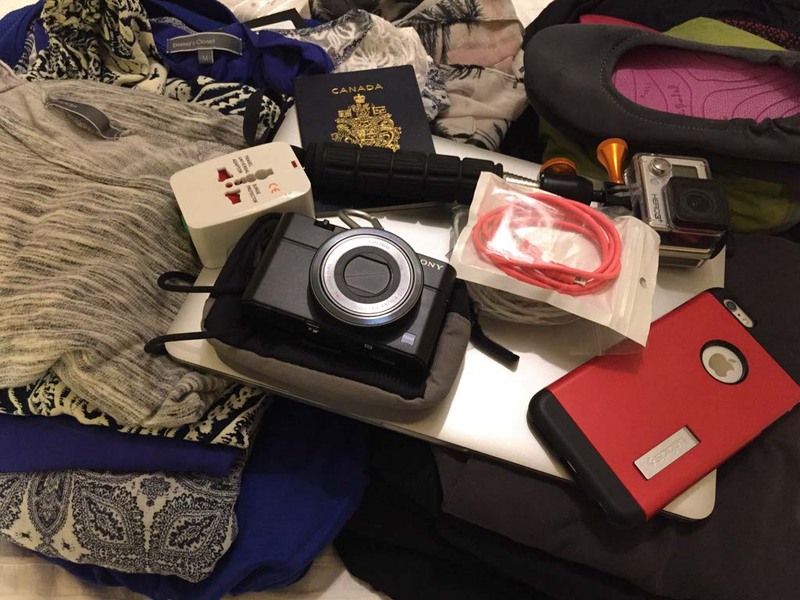 Diapers, bottles, clothes, food, wipes, toys… I managed to bring it all on the plane with me. Now that my daughter is three years old, we’re back to a much simpler packing list. Do you usually check a bag? I do usually pack a small bag, and as a family we travel very light, even with a baby. I think too that US travel regs are such that carry on bag allowances are bigger than in Asia Pacific. Yep, I think you’re right with the allowances. Do you have any trips coming up? Cook Islands in July, and we will be aiming for the smallest packing possible! I haven’t been to the Cook Islands yet. Will this be your first time there? I think I need to add it to my 2016 list. Are you going as a family? First time, with the Family to Rarotonga – can’t wait (surely somewhere in the world it is July with timezones and date lines). I have the luggage allowance, so we shall see. Definitely blog about it. etc. We carried a couple of jackets (one heavy in case it got cold). We needed some extra space in case we bought some gifts. Like you said it depends on where one is going. You are an experienced traveller. I always admire people who manage to travel light. I’m trying to get to the point of being totally carry on but haven’t quite made it yet. You should see my camera equipment bag! LOL This looks good though! Incase has some great options for camera equipment too. I’m going to try out just using the EO Travel bag for a couple trips and see if I can manage. If not, I might look at getting the EO Roller too. Where are you off to next? Do you have anything planned? Have you been to St. Lucia before? It is such a beautiful place. I stayed at Windjammer Landing the last time I was there and it was one of my favorite resorts ever. What brings you to Arizona? Which part will you visit? It’s such a beautiful state. I think I’ll need to put it back on my list. Pretty cool backpack. For our Bike & Barge Tour in the Netherlands in a week m’lady and I are sharing a borrowed A. Saks 31″ Expandable Rolling Trolley Duffel. We’ll be gone 12 days but I like the looks of that backpack for extra gear or shorter trips. I used a Duffel bag for my trip to Antarctica too. It was all that we were allowed to have in our cabins. That sounds like a fantastic trip. You can make good use of your watch there 😉 What are your plans while you’re there? We will arrive in the Netherlands several days early and stay in The Hague (Den Haag) to acclimate as we have been to Amsterdam many times. We will then join International Bicycle Tours for our totally guided tour. Bikes are provided and we sleep in our private cabin with bath each night on the barge, where breakfast and supper are also included. During the day we bike from town to town, having lunch along the way, while the barge makes its way along the canals to the next overnight. We sight-see along the way, one of the highlights being the Keukenhof (sp?) tulip gardens, which we are eager to see again as it should be in full bloom. I will post more either during or after the trip. Thanks for the review! I love how it opens up like a suitcase something thats very unique. The EO Travel Backpack has a triple coated weather-resistant front panel, but it is not waterproof. If you’ll be backpack, I’d suggest more of a hiking pack like an Osprey or a Kelty. How long will you be there? Which countries do you plan on visiting? That’s so exciting! Have you been before? I can’t wait to hear more. Thanks for your interest!! I will be there for 6 weeks actually, I want to prove to myself that I can actually survive with one backpack 😀 I’ll start off in Thailand then visit the countries close to it, so Laos, Cambodia and Vietnam. It will be my first time to Southeast Asia!! So I’m super excited and nervous too! Have you been? Do you have any tips? This looks like a great bag! What does it normally cost? I’m trying to find a way to pack for my family of 6 for 2 weeks in the UK- with public transportation and a rental car with little visible cargo space, I want to pack as compactly as possible-i.e. no big American suitcase! This looks great, but I don’t know if buying 2 would work- any more, would be too expensive 🙂 Any tips would be greatly appreciated! Good backpacks pay for themselves tenfold. I’m not necessarily saying buy two of these, but you should consider a good backpack. It will save you tons in luggage fees and make the trip easier. I don’t know the ages of your family members, but try to pack things that are interchangeable. Cheap dollar store rain ponchos are easy to pack and save tons of space rather than bringing rain jackets. Try to bring clothes that are versatile and think about the activities that you’ll be doing. What are the age ranges? What types of activities will you be doing? 16,14,13, and 10. So, they are pretty big, but hopefully not too messy or concerned with a variety of outfits- my 13 year old daughter excluded 🙂 I had planned on packing light- we are only sightseeing, light hiking, maybe snorkeling with seals- but they provide the gear, so, really, no special gear. As it’s an international flight, we have no baggage fees, so my biggest concern is what is easiest to shlep around. Oh they are great ages to carry their own packs. 1. Limit each person to one bag. 2. Bring layers rather than a jacket. 4. Roll your clothes to save space. 5. I never bring enough socks or underwear. They are easy to rinse out at night and hang so you don’t need to bring enough for the entire trip. 6. Pick items that can serve double or triple duty. Thank you for the advice- I really appreciate it! Have a great trip to Israel! There are so many neat features that make total sense…..like being able to remove your laptop easily at the security area, also being able to open the compartment for your clothing…so much easier to keep things organized instead of having everything bunched together! Good choice!! I love the laptop part. I struggled with that with my last bag. I was always dropping everything on top of it and it took forever to get out at customs. Annoying! The clothes compartment is awesome too. I can’t wait to test it out. Thank you, Shelby. Israel has been on my list for years. It will be an amazing experience. Have you been? No, but my husband and I hope to make a pilgrimage of sorts to lay in the Dead Sea and go to some of the places Jesus walked and taught. I am so excited to see pictures of your trip!! Looks like a great bag but I can’t get over that you have never checked a bag, that’s impressive. We thought we did well packing for our 9 month trip getting it down to 4 medium suitcases. I also use a Lowepro 450 ProTactic backpack just for camera gear, laptop, tripod and ancillary gear. The camera gear can take up a lot of space, but it can be worth it. What countries did you visit during your trip? Are you still traveling now? Have a wonderful trip. You are welcome to come up here and take that unplanned trip on the Napa Wine Train! That’s on my list for this year but I think it won’t be for a couple months yet. We decided to head down to San Diego for the zoo and maybe Legoland. I’ve always wanted to take Athena to Legoland. Have you been? No. I’ve always wanted to go too. I have had family and friends who have gone and they loved it! You will have a blast! wow, pretty cool! but i don’t think i could ever pack that light -__- i need to learn! Wait, what? When are you going to Israel?? I mean, man… that could have been an ideal hook up– my girl lives there; I go as often as I can. Wow. Have a great time! It’s a strange time in Israel (my last piece about it was in Huff Po) but you will not eat a bad meal, and it’s a beautiful country! I happen to know everyone in the video, and I have a quick “cameo” 😉 I wasn’t paid, and I’m not paid to endorse it, but I have 2 of these, because they’re awesome! Shalom! What a great backpack! It sounds compact and expansive. I love all the pockets! Looks like a great bag I really like the way it splits open, when had to by jet to Scotland I took just hand luggage no waiting, just on and off saved so much time. My problem in the bag checking department is my hair product!! It’s hard to be limited to 3 oz. of a liquid when the trip is longer than a week… Cool bag! This looks great! I love that it opens up like a suitcase. That’s probably my only complaint about my current carry-on backpack, an REI 25L. It also has the laptop compartment and separate compartment in the front for important documents, pens, etc. You are so right about pens for customs forms! Although I tend to use my tote for a lot of those. I travel either with a tote bag or a cross-body satchel, and that’s usually where I stash my camera, documents, itinerary, and all the other stuff I need to get to in a hurry! Coming from such a seasoned traveler as yourself, this is one endorsement I would definitely trust. I confess I don’t travel nearly as often as you do, and, when I do, I pack a suitcase that’s large enough to get into an airline overhead bupboard or under a seat. That way I can be certain it will arrive WITH ME when I (hopefully) get to my destination. I am in search for a bag that I want to take for a 2 week vacation in Europe. I am very divided between Timbuk2 Aviator and this bag. The main plus as I see for this backpack is the number of pockets it has and of course the almost pull away laptop compartment. On the other hand aviator has a hip built and solid construction. Was wondering how it worked for you on your Israel trip.